This exquisitely cut Monogram Necklace in 14K Yellow Gold features flawless lettering that is sure to impress even the most discerning tastes. It makes for an original piece of jewelry that is not so easily copied, since it features up to three letters of your own choosing. The monogram itself measures approximately 37mm by 30mm and is a true delight for anyone who appreciates beautiful design. The lettering is so decorative that the pendant appears regal in nature. The piece is made of 14K yellow gold shined to a high polish, which catches the light. All of the letters feature a nicely rounded edge to enhance the soft, delicate appeal of the piece. This lovely necklace is both sentimental and original because it is a reflection of who you are. The pendant has a simple gold loop attachment for the chain on either side, which allows it to hang perfectly level around the neck for all to see. This gold necklace is just the type of jewelry that could easily become a family heirloom, treasured for years to come for its very special and personal meaning. 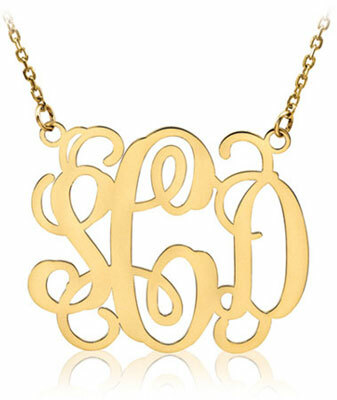 We guarantee our Monogram Necklace, 14K Yellow Gold to be high quality, authentic jewelry, as described above.